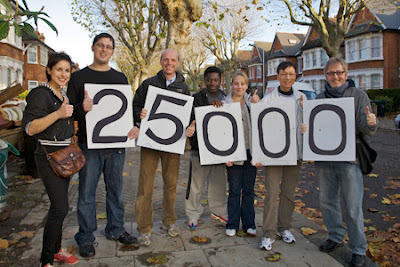 Ben Aquila's blog: 25.000 views... you make it possible! 25.000 views... you make it possible! I started blogging last November 19th and today my blog has reached 25.000 views. I can't believe it, but time flies. I have to thank all my readers and followers because they make it possible. Their interest and support, and their suggestions and comments too, let me to improve everyday and motivate me to continue. But, nothing of this could be possible without help and advices of my husband Ryce Skytower, I love you baby! congratulations. It is because you write so well and have much to say that is important. BTW the next 25,000 will be here before you now it, and once you hit 50,000 100,000 is around the corner! you will see. Ryce sends his love and is proud of you! Awe thanks Eddi! You know all of this is new for me, and I try to do all my best but enjoying too. The true is with Ryce's support all is easier. Kisses!